Add brightness and cheer to your garden with the beautiful Sarah Bernhardt Peony. This peony displays an abundance of glorious blossoms from late spring to early summer. The large 5- to 7-inch double blooms are a stunning frosty pink with tiny red flecks and delicate pale edges. Welcome summer with an exuberant display of colour and fragrance. 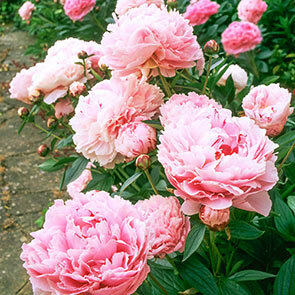 The fragrant Sarah Bernhardt peony grows to 34 inches tall and is recommended for zones 3 through 8. 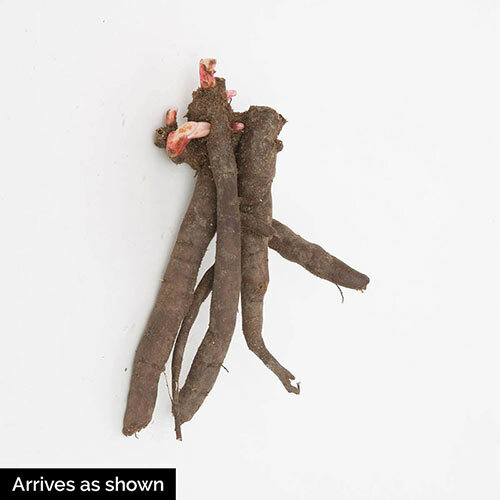 These charming plants flourish in full or half sun in well-drained soil, but will tolerate moist or wet soil. Plant them in the fall for best results. Cover your bareroot Sarah Bernhardt peonies 2 inches below the soil line and space them 24 to 30 inches apart to allow for the plant's 24- to 36-inch spread. This easy-care perennial peony is drought-resistant. Peonies provide a dramatic splash of colour around the foundation of the house, in a patio garden or with a backdrop of shrubs or trees to provide a little drama. The Sarah Bernhardt peony also produces sweet-scented, long-lasting cut flowers to decorate your home, and these saucy blooms make a great accompaniment to other late-spring flowers such as Asiatic lilies or mountain bells. Adorn your garden with this delightfully appealing perennial peony to provide years of enjoyment. Flower Form Fully double, approx. 7-8" in diameter. Foliage Type Medium to dark green foliage with a reddish hue.